Identifying needs, searching for solutions and sourcing the right partnerships is complex, time-consuming and expensive. If you select the wrong solution, your job could be on the line. 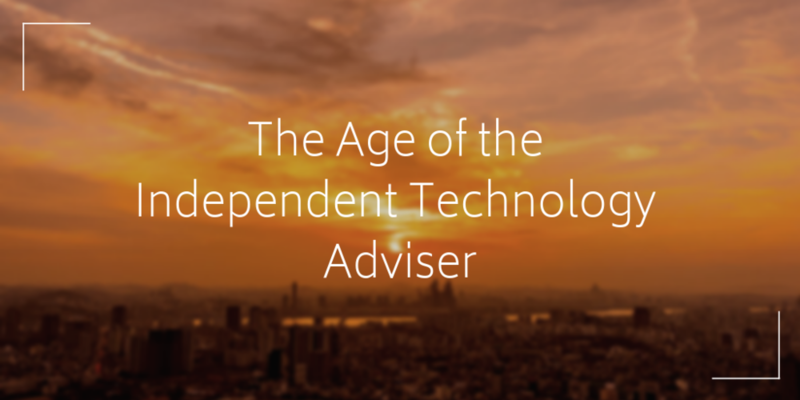 This environment has driven Independent Technology Advisers (ITAs) to emerge. Much like how specialist financial advisers operate, Independent Technology Advisers do the same with business technology. These experts help organisations simplify IT procurement, reduce risk, identify the most cost-effective solution and reclaim the many man hours spent with procuring technology. This monumental shift towards the cloud and ‘as-a-Service’ technologies means organisations are having to redesign their infrastructure, restructure their IT and implement new solutions to keep up with employee demands. Do you have the right IT for your business objectives? Are your sourcing and procurement processes evolving? How quickly can you leverage technology for new ideas and innovation? What happens with your next critical IT service contract negotiation? Can you maximise the value of your vendor relationships? Answering these questions confidently is crucial to long-term success as is equipping your business with the tools, technologies and solutions to outperform competitors. It’s also where Independent Technology Advisers excel. We should know - we work through our network consisting of hundreds of suppliers to source the most appropriate IT, network or cloud solution for your business objective. This service, at no cost to you, is fully agnostic and provides you with a seamless, easy-to-implement recommendation. After all, would you rather knock on 30 or 40 doors getting to know every supplier yourself or would you prefer that supplier simply to come to you, ready with the solution you need? Action your future today and book your free 15 minute introductory assessment!